The Lodge at Teton Springs opened in December 2007 and instantly raised the bar on accommodations, not just in the in Teton Mountains, but in all of eastern Idaho. What particularly separates this property from all other hotels in the cozy Teton Valley is not just limited to the quality of the hotel rooms and suites, but the compete resort experience afforded all guests. It’s easy to pursue one’s passion by simply stepping outside the Lodge; fishing on the resort’s private ponds, hiking and biking, dining, swimming, spa services and golf. 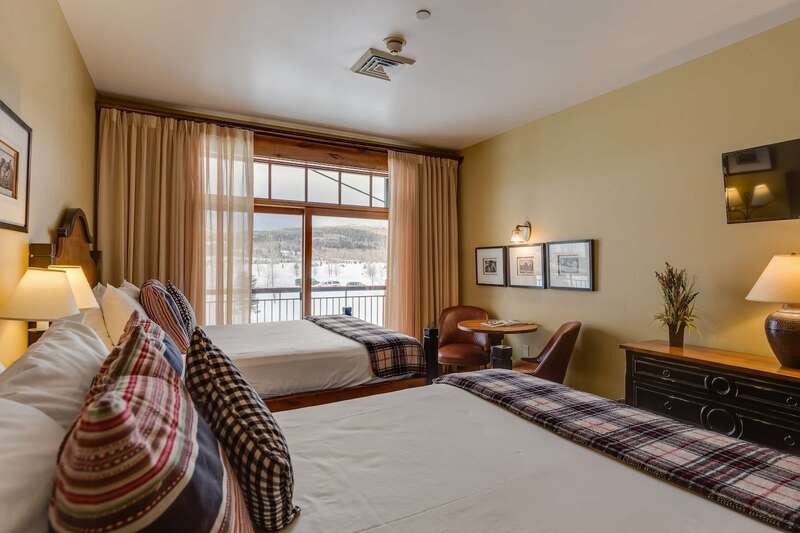 Surrounded by the Big Hole and Teton Mountains, this charming hotel offers just the right mix of accommodations that are designed to perfectly suit traveling parties of any size. 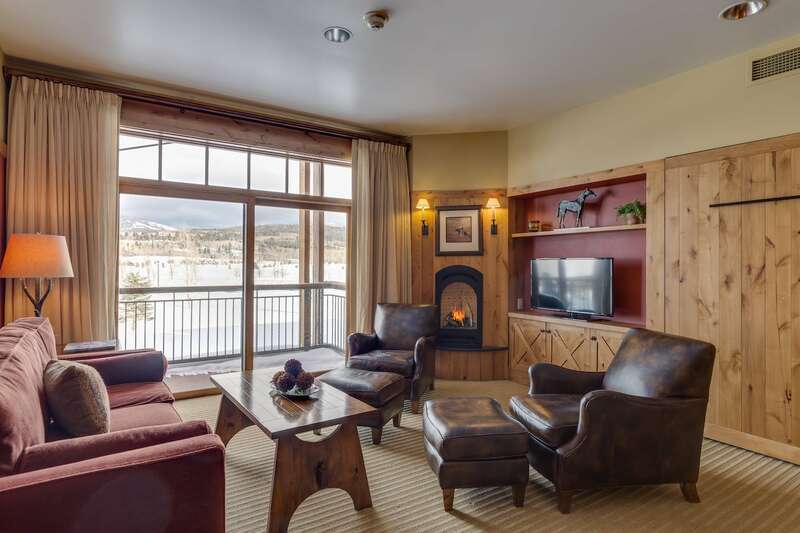 Guests can take in the panoramic views of the mountains that surround Teton Springs from their private patio or balcony. There’s even a resident Bald Eagle who likes to perch in the trees right outside the lodge. Pack the camera! The Lodge contains 52 well-appointed units and each unit represents the comfortable yet luxurious atmosphere provided by a condominium hotel. Few hotels can boast a 400 square foot hotel room, equipped with two queen size beds and balcony or patio, referred to as our “deluxe lodge room.” While many properties would refer to this lodge room configuration as their “standard” room, there is nothing standard about this unit. Guests seeking a more home-away-from-home feel can choose one of the 785 square foot one-bedroom or 1,160 square foot two-bedroom units. Fully equipped accommodations in the one- and two-bedroom units include full kitchens, elegant living room, fireplaces, large balconies and intricately tiled baths with relaxing whirlpool. 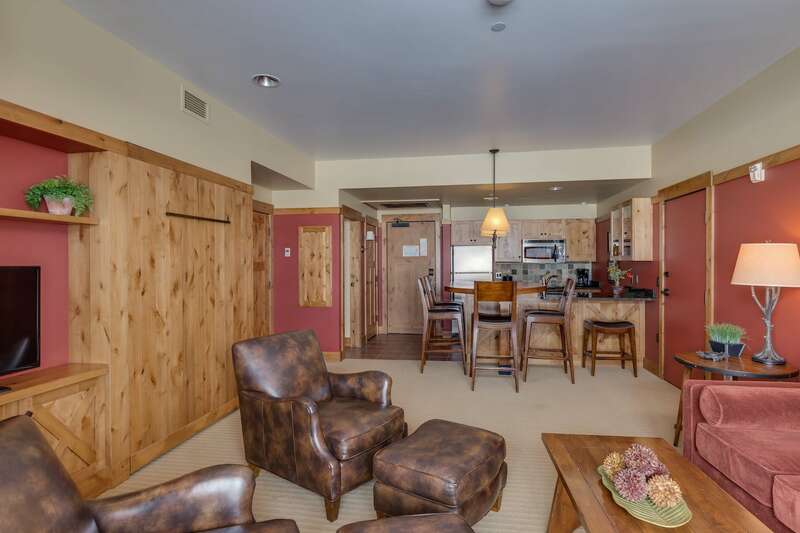 With its three separate sleeping units and three full baths, the two-bedroom suite is perfect for parties of 8, whether it be a family here to sample the regions incredible recreation, tour the nearby National Parks, or a group of friends anxious to hit the links. Both one- and two-bedroom suites feature full kitchens with enough pots and pans and other necessities to whip up gourmet meals while you’re here. There’s also a lovely dining area perfect for entertaining. Custom designed furnishings in all units reflect the chic western décor with an earth tone inspired palette and cozy designer furniture. Lodge guests can slip on the comfy robes found in each unit and head to the Stillwaters Spa & Salon. Located on the ground floor of the Lodge and just steps, or a quick elevator ride away, the Spa features a full menu of massage treatment options including deep tissue, sports and injury management and pregnancy massages. A romantic duo often opt for a massage in the Couples Massage Room. Other treatment favorites include facials, reflexology, aromatherapy, paraffin wax therapy and hot stone treatments. The Salon specializes in hair & nail services. The spa, in keeping with its beautiful tranquil setting, is a sanctuary from the outside world. Terrific spa packages are available for lodging guests. The Lodge at Teton Springs – the perfect combination of luxury & adventure!